Why is it that I can’t get enough of buffalo-chicken-flavored things? I ordered something “buffalo-style” last week at lunch and my co-worker laughed and said “You seriously have an obsession with buffalo flavor don’t you?” Um, yes…have you read my blog? Well, just when you thought I couldn’t possibly come up with another thing to layer with blue cheese, celery and hot sauce – I went and did it again. With my Memphis Grizzlies in round 3 of the NBA Playoffs, it’s tough to want to make like, roasted fish with vegetables for dinner when a game is on – I need (faux) bar food! So I’ve sliced up potatoes before to make my own cheese fries, but my Tuesday evening did not warrant that kind of effort after my workout. 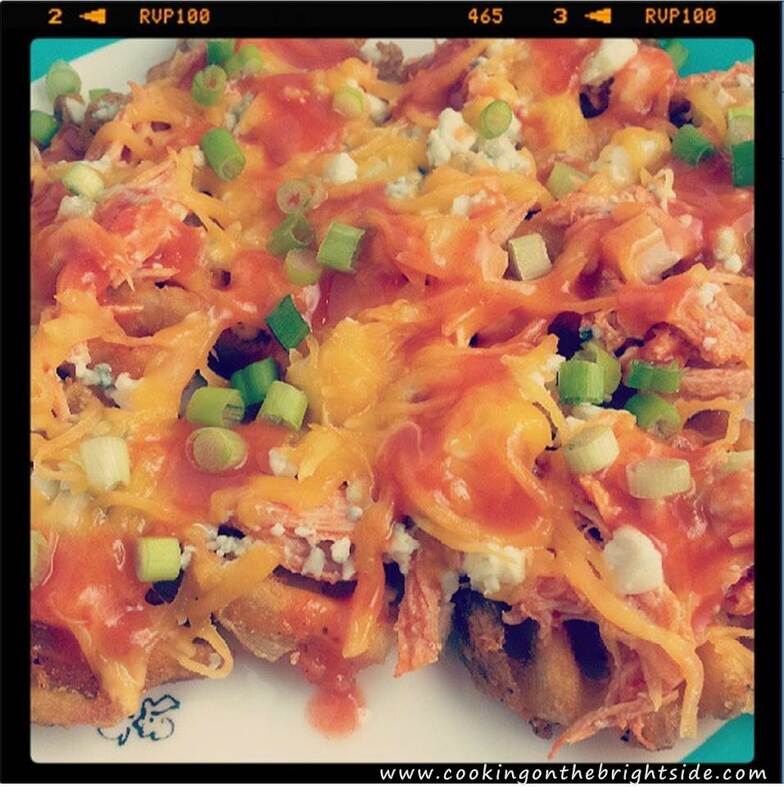 Then I remembered seeing a recipe on a blog I follow (“My Life as a Mrs.” check her out!) 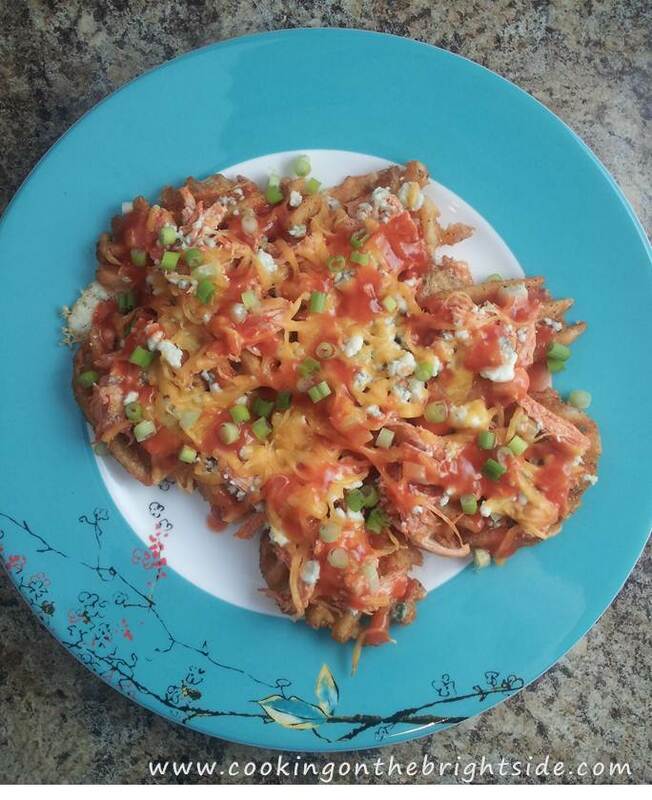 for buffalo cheese fries using frozen french fries, so I gave it a shot. Y’all, these are so delicious – and I portioned it out to make sure it was enough food without being totally horrible for you! I’m sure they’d be a welcome addition to any party you are attending this holiday weekend! Slightly modified from original recipe found here. Heat your oven to 400. 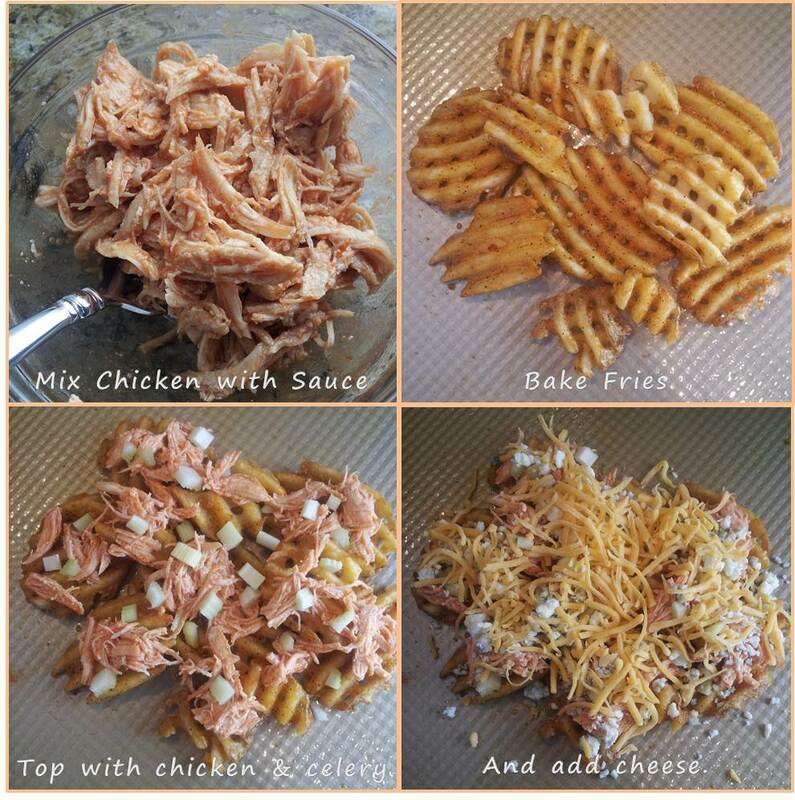 Layer fries on a baking sheet and bake according to directions. Chop your veggies and mix your chicken with the hot sauce. When fries are done baking, move them close together and top with chicken and celery. (I separated mine into 2 portions because the hubby was studying and wanted to eat later, so this portion is allll for me.) Then top with blue cheese crumbles and shredded cheddar. Bake another 5 minutes, or until cheese has melted. Sprinkle with additional hot sauce and add green onions and serve with ranch on the side for dipping. I barely needed any ranch, as these were so full of flavor! 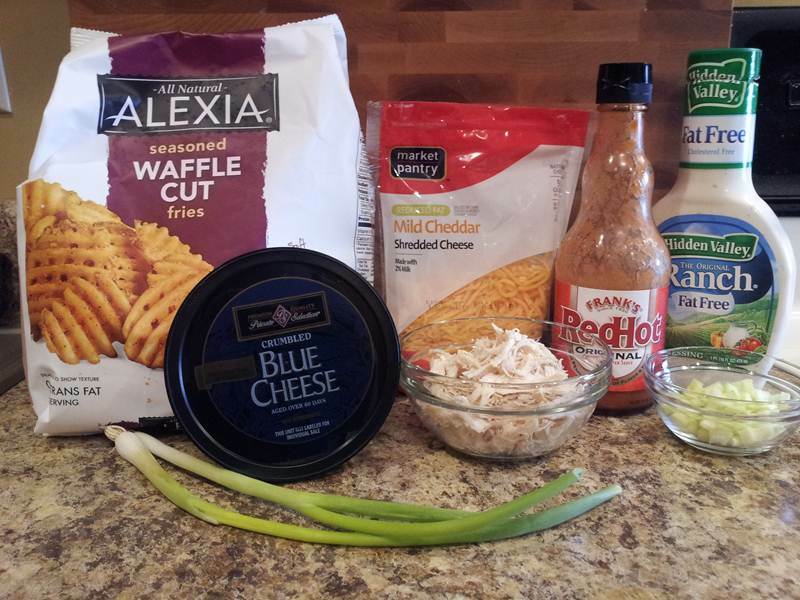 Try it out if you’re a buffalo chicken freak fan like me, or if you just want to try a new (and healthy!) twist on a classic. Have a wonderful Memorial Day weekend everybody! 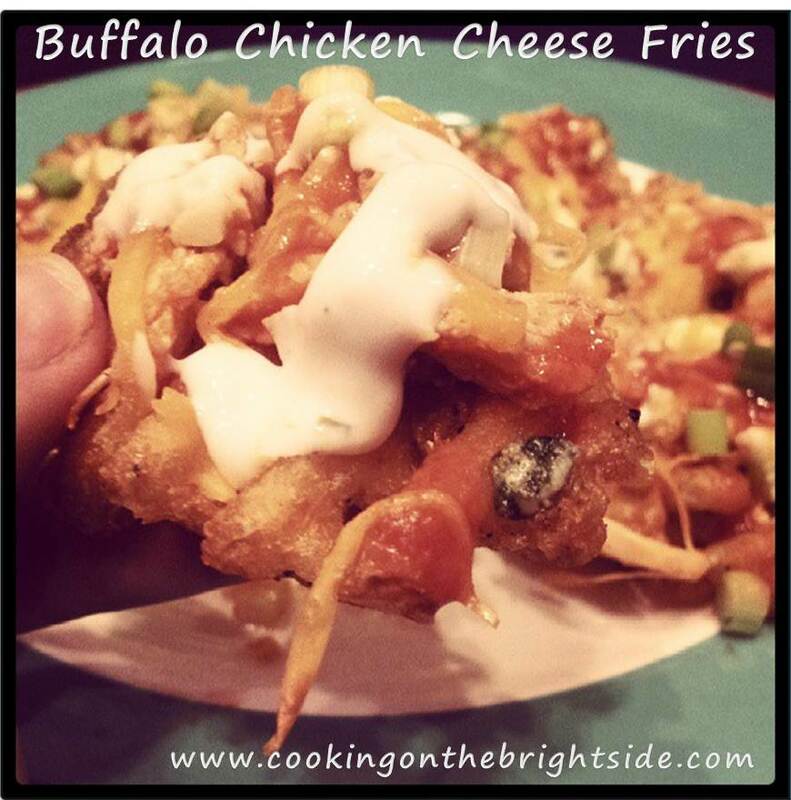 This entry was posted in Appetizers, Bites, Chicken, Main Courses and tagged buffalo chicken cheese fries, buffalo chicken flavor, buffalo flavored cheese fries, faux bar food, weight watchers appetizers, weight watchers buffalo chicken by cookingonthebrightside. Bookmark the permalink. Wow – these do look yummy!